I saw a post a few weeks ago on Consumerism Commentary where Flexo got a credit card that he didn’t ask for and really wasn’t all that happy about it. When Citi sent a replacement credit card for his Dividend MasterCard, they also sent an American Express card. I read the story with interest, because both my wife and I hold Dividend MasterCards and use them as our primary credit cards, turning down other cards in favor of the cash back that our Dividends card gives us. Most of Flexo’s readers that left comments were similarly put off by getting a card ‘forced’ without asking. So, when my replacement card came in the mail last week, I looked inside, and also found two cards. My MasterCard had the same account number, just with a new expiration date. The American Express card was right there as well. Everything shows up on one billing statement and transaction list. No need to log in to two accounts or pay two bills or anything like that. I wasn’t too bothered by all this and was sort of neutral by the whole thing, so I decided to activate the card. I’ve had the card since 2004, have never paid a lick of interest, and have gotten cash back in the four figures, so I was OK with it. During my call, though, I actually realized this could be a good thing for me. Wait a minute, did she just say Costco? Costco only accepts cash, debit cards, or American Express payments. We don’t do much in the way of cash for most of our spending. We only want and have one credit card each (the Citi Dividends card), so we never went with an American Express. This meant that our Costco purchases get made using our debit card. This worked, but our days of getting any rewards for using our debit card are long gone. 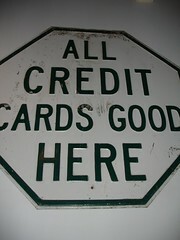 But, with the new AmEx card add-on, I can swipe it at Costco and get cash back! Now, our Costco spending isn’t astronomical so this isn’t going to make us rich, but it will definitely add some extra cash back in our pockets, and every little bit of that helps, right? Now, I know there are other cards that give you better rewards at Costco. I get that. But, I try to keep a minimum number of credit cards for the sake of convenience and for keeping my credit score pristine. Now, I can get some cash back and not have any additional payments to make or any additional credit lines showing on my credit report. I’m more than good with that. Have you heard of having one credit card with two different providers? Are you in Flexo’s court where you think this is a bad idea or am I onto something by being OK with this?